We are very happy to announce that the AudioSalad for Shopify App now supports the delivery of Playlists for download sale. In the same way that you are able to import your catalog for digital download sales, you can now offer specialized playlists for sale via AudioSalad. This includes traditional playlists made of individual tracks, as well as playlists made up of full releases. Specialized Top 10 lists, Artist’s Favorites, Playlist deals and more, the possibilities for playlist themes (and sales!) are endless. No upgrade is needed for this feature to appear in your version of Shopify, so what are you waiting for? 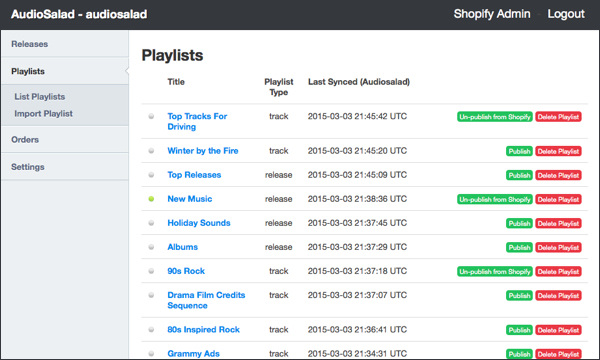 Start selling your playlists via our AudioSalad for Shopify App today!